"There's one science fiction story I'll never read again - Wells' "War of the Worlds." It was the first of its kind for me, and the thrill of that first contact with the realm of imagined science is something I never want to lose. I'm afraid the wonderful aura that went with its reading would be hard to recapture now. But the memory of it will always remain. That was in 1927 and Amazing published it. Ray Cummings and Ralph Milne Farley and Dr. Breuer and A. Hyatt Verrill were sketching the future as they saw it. I often wonder if the fellows who meet science fiction for the first time today are getting the feeling out of it that we did then. I like to think so. Science fiction inspired the course of my studies through high school and college. I ended up in radio engineering as a result, but in the dim days of the '30's radio operators were quite unneeded. I left my home town of Salt Lake City and wandered around Texas a bit. Later I took up the nomadic life of an installer of telephone exchange equipment for Western Electric. That was too nomadic for a married man, which I became in 1940, and I settled down with the Weather Bureau. During the war, I returned to electronics in the engineering department of Bendix Radio at Baltimore. Afterwards, I returned to Phoenix, Arizona where the climate is more amenable. Since 1940 my science fiction writing has been going on at sporadic intervals. Like most other sf writers, I began it for fun and it still is. There's nothing I'd rather do than spend my eight bread-and-butter hours per day writing science fiction, and Forry Ackerman, agenting in Hollywood, has done a nice job of selling everything I've written for the past couple of years. Unfortunately, the economics of the publishing business seem to dictate that an sf writer be a writer second and make his living elsewhere. No matter how much he loves this stuff he can't support big blondes and fish tail cadillacs with it, as is commonly supposed. In fact, there is difficulty with the midget blonde holding the dismembered doll. She has two brothers and two sisters - and they all eat. I'm branching out to other, more mundane fields of writing now, to find some sort of compromise that will let me feed the little blonde and still get the enjoyment of science fiction work. My stories have been all kinds - blood and thunder, and technical yarns so complex I wasn't sure I understood them myself. I have often attempted to combine a scientific problem with a human one, and these have made my best stories. Some of you may remember "The Children's Room" in Fantastic Adventures a few years back, and now currently appearing in The Toymaker. That's the kind of story I like to write. They are the hardest to do, and - for some reason I haven't figured out yet - still harder to sell. I don't believe there is a storytelling medium that can surpass science fiction. But somehow, I think we're still missing the boat. Bob Heinlein and Ron Hubbard, in the best of their work, have shown more all-around skill than any of the rest of us in making sf a legitimate branch of writing. But they seem to be lost to the magazines now, and there has grown with appalling rapidity in the past year a pseudo-sophisticated, Edgar Allen Poe technique of accepting the most bizarre concepts of man's future life and throwing in a few characters to react. They succeed only in looking naked or at best like the bottled specimens in a high school biology lab. The premise is wrong. Backgrounds and cultures are products of people who create them, and storytelling is the art of showing these people in that act of creation. A story is of living things, not a bizarre exercise in narrative technique curiously labelled "adult". Men of the future will be pretty much the same as men of today or yesterday in basic makeup. Their surroundings needn't be distilled out of Poe. Their problems will be our problems with new dimensions and new colors. They won't all be of galactic magnitude or involve only the hetrarchs of far domains, and interstellar war (let us hope) to the degree that sf would have us now believe. There'll be the spaceship manufacturer who gets a yen in declining years to dump his dull-seeming family who take space flight for granted. He can remember the time before spaceflight, and he remembers its thrill and its awe. He determines to get it again. There'll be the woman whose husband and father are spacemen, and who is determined that her boy will not be. There is a story in them - the woman, the father, the husband, the son. In each is a quiet story of the internal dynamite that the future can plant in the souls of men. Men like us, with problems like ours, in a plausible world of other times and other spaces. These things to me are more than imitations of Poe and galactic intrigue and the scientist who talks like a private eye. This is the way I feel and these are the stories I'd like to tell. And in them I'd like to pass on the thrill of science fiction that I encountered 25 years ago. With the help of my new IBM you'll be reading all I can persuade editors to buy. And I'd like to know how you feel about them!" - RFJ. This autobiographical piece appeared in the Summer 1947 issue of Planet Stories magazine, alongside the story "The Martian Circe:"
"Well, I'm not a fan-letter writer, but I've been on a pretty heavy diet of STF and fantasy for the past nineteen years. Anybody here been around any longer? It all started that eventful day that I wangled two-bits to buy Hugo Gernsback's old publication carrying "The War of the Worlds." It had the same effect on me then that the broadcast three or four years ago had on the whole country. And when the neighbor kids borrowed some of the magazines they were ordered to bring them back pronto by mothers who looked upon mine with a strange pity in their eyes. In Junior High, I spent the time in geography classes drawing up engineering specifications for the land, sea, and air contraption described in Jules Verne's "Robur the Conqueror." Then along in there somewhere I decided to become a radio engineer and at the same time pick up a little easy cash writing some of the fantastic stuff. That led to a case of split personality which hasn't been cured yet. I hammered along through four years of college, alternating between the school of Engineering and the school of English, trying to find out how to hook words and circuits together. Sometimes the words got where the circuits should have been... That college English was a mistake. If you want to be a writer, never trust a college English prof. Just remember he's there because he isn't any good anywhere else - generally speaking. After the gloss of college began to get knocked off (I mean knocked!) the writing began to improve and get printed now and then. But the radio business wasn't so hot, that being near the end of the recession. Remember those things? Being married and a family man by then, I required cash in large and steady amounts, so I found a job that wasn't even a fifteenth cousin to anything I'd ever studied, but it was a living. During the war, however, there came a chance at radio engineering work. At that time I made the discovery that all the industrial plants in the country are located in the most abominable climates on the continent. The doc advised me to get out of the East Coast soup and back to the great open spaces of the Southwest where a guy can dry out once in a while. I became convinced that if the Pilgrims had gone the other way and settled the West and Rocky Mountain country first the Indians would still have everything east of the Mississippi and there'd be no arguments. When I got back here (Arizona) I added up the few published words of mine and got a total of somewhere around 350,000, which was not much but enough to make me think I might make a go of this. Then I figured out the time spent on it. The pay rate per hour was several times greater than any I could possibly earn in radio engineering or anything else I'd done. The Great Decision was made. I'd be a professional writer. (Well - I could try. Somebody must have read the words I'd had published). Anyway, my shingle is up. If you happen to like this stuff even just a little bit, drop a kind word to the Boss. There's lots more where it came from." 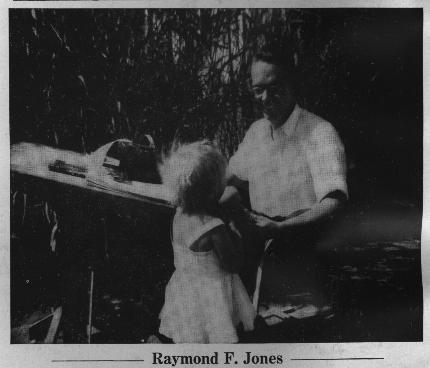 - RAYMOND F. JONES. Hope you enjoyed reading these as much as I did when I finally tracked down the pulps they could be found in. I believe these two sketches give us some interesting insights. It is clear that Jones, being a family man (he was a mormon from birth), needed to make sure his stories sold and made money. Forrest Ackerman, his agent, was no doubt instrumental in getting the stories sold to the right magazines on a regular basis. Jones's output of short stories and novelettes in the 1940s and 50s was prodigious. It is also clear that Jones wrote for specific markets - his work for Campbell's Astounding was typical of the kind of stories one found in that magazine. Likewise stories such as "The Martian Circe", written for Planet Stories, were typical space-opera yarns the likes of which Leigh Brackett wrote for just the same markets. Jones was not by any means a hack writer. All throughout his career, even in his later work for Roger Elwood anthologies (which were aimed principally at the juvenile market), Jones put his own original stamp on everything he wrote. His stories would often concur with the literary demands of a given editor, but rather be constrained by this, Jones would quite clearly flourish under editorial guidance whilst retaining his own unique voice. - RICHARD SIMMS.